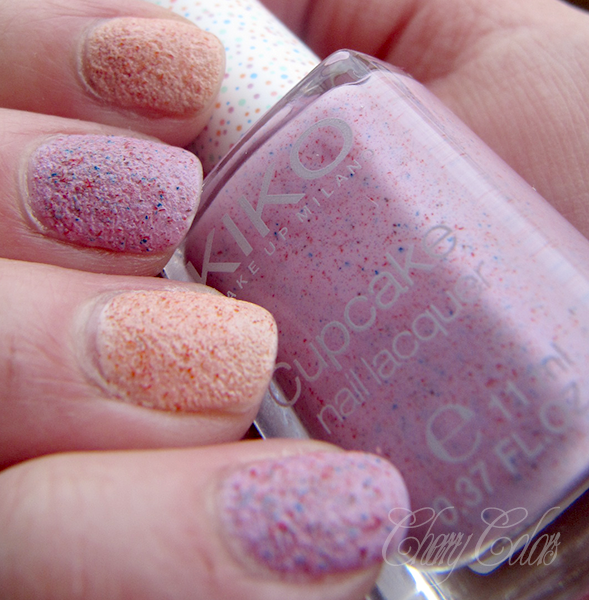 NOTD: Kiko cupcakes (Pesca and Lilla) - Cherry Colors - Cosmetics Heaven! 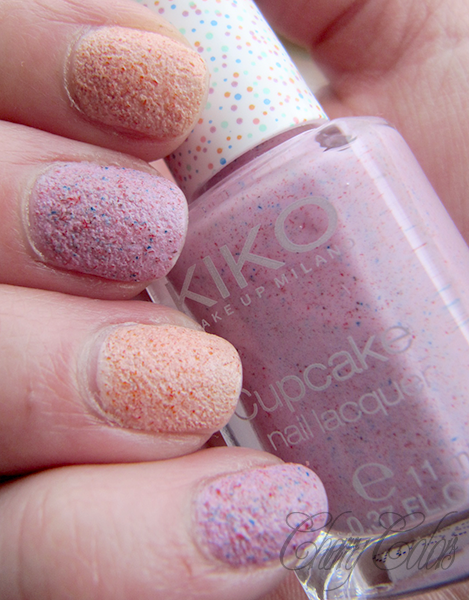 I went to Italy to grab a bunch of new Kiko polishes from the Cupcakes collection. I was lucky as I found the full shelf of them! It was a very exciting experience. 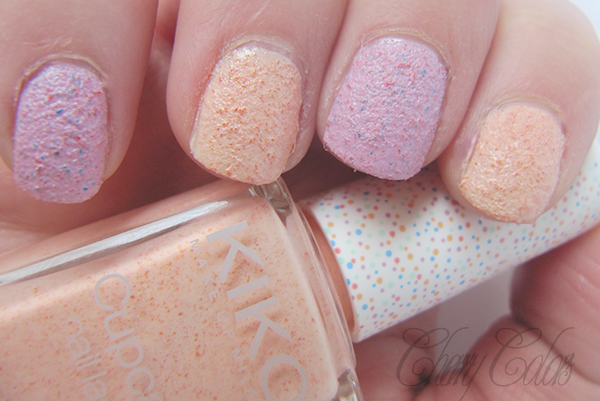 The polishes are of many (10) gorgeously pastel shades. I really like the cap design, very Easter egg like. I needed two coats for 100% opacity. The drying time is good, as they are completely dry in about 10 minutes. The application is somewhat tricky, as they are a bit thicker than your regular polishes, but it can be done nicely after a learning curve. At first I was sceptical about the texture, but after a day or two (when it was less rubber-like), I found myself liking it. So here it is, five minutes after the application. It still looks a bit wet and fresh, doesn't it? And completely dry, I think this was day two? The cuticles got some caring, so they looked better than the first day :). I wanted to say, that I did try to apply some top coat on, but since I like to use thin layers, it didn't show and it didn't alter the texture of the polish at all. 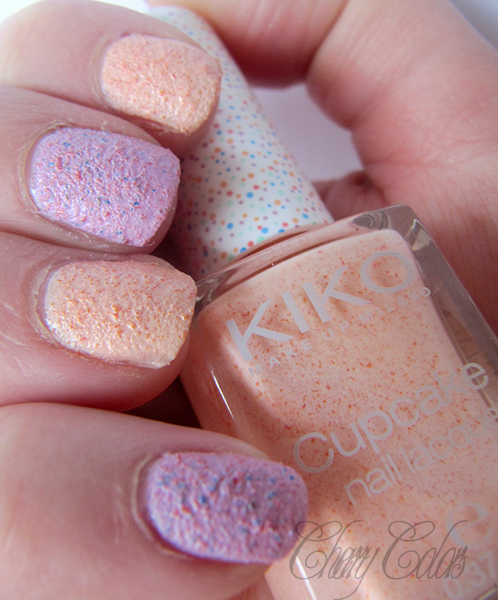 I saw some glossy looks achieved with the Kiko gel like top coat, so it probably works with a thicker top coat? I do not know. 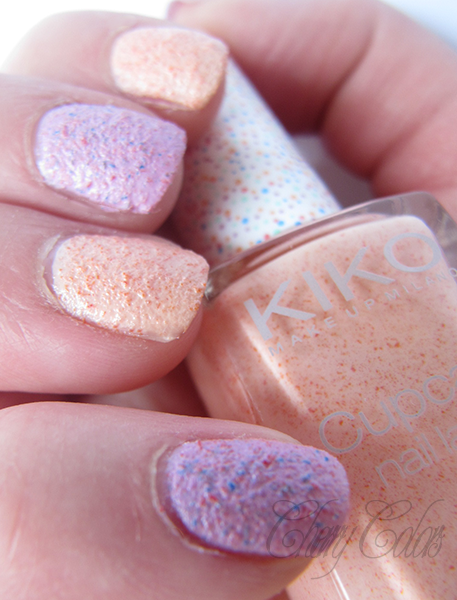 I really like these polishes as they are perfect for Spring, they feel so fresh, and they do remind me of fruit yoghurts.